According to the leading travel dating website and app tourbar.com, travel-lovers in the UK have named ‘staycations’ as their preferred style of travel for trips to take alone. 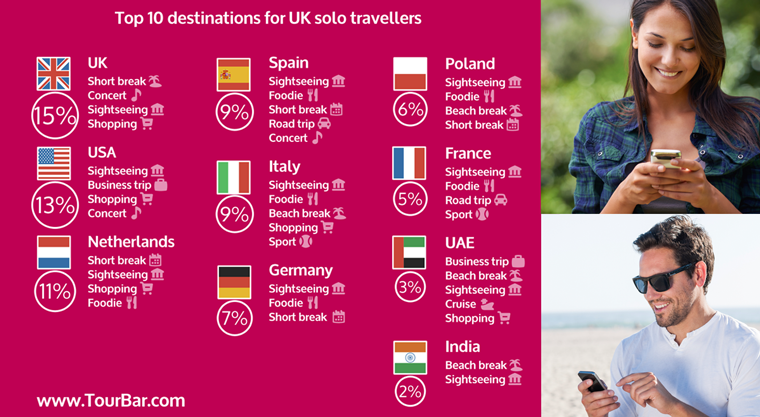 Of TourBar’s 15,000 UK members, 15%% named various locations in the UK as the top destination they have visited by themselves in the past six months, with the most popular reason for travelling alone in the UK being for short and weekend breaks followed closely by travelling alone for concerts and festivals. These solo travellers then use the TourBar app to reach out to other solo travellers heading to the same location and events. TourBar’s latest research also reveals the other destinations that make up the top 10 travel hotspots for UK solo travellers, with the USA taking second place (13%%) and the Netherlands (11%%) being named the third most popular destination. When TourBar members register their solo travel plans to find a companion to join them on a trip, they choose their interests and reasons for travel in order to help find a like-minded partner. The recent findings reveal that sightseeing and business trips were the top reasons behind most UK travellers travelling alone to the USA. For the Netherlands, it was the draw of weekend breaks and sightseeing that secured its third place for solo travels. Europe’s culinary capitals Spain and Italy tied to take the fourth most popular destinations (9%%), with travellers naming sightseeing and foodie tours as the top reasons they were visiting the two countries alone. The three remaining European destinations in the research were Germany (7%%), Poland (6%%) and France (5%%), recognising a growing trend for gastronomic tourism, with each of the destinations’ solo travellers recording foodie tours as the second most popular reason to visit the country alone. When it comes to destinations further afield, the research reveals that the UAE (3%%) and India (2%%) are the ninth and tenth most popular destinations for British solo travellers, with the lure of beach breaks featuring as one of the key reasons to visit both the destinations, whilst those travelling to the UAE favoured solo business trips as the top reason for travelling alone.